Audience members at a Monday night meeting were divided into three groups to brainstorm visions for the Big Four Depot. 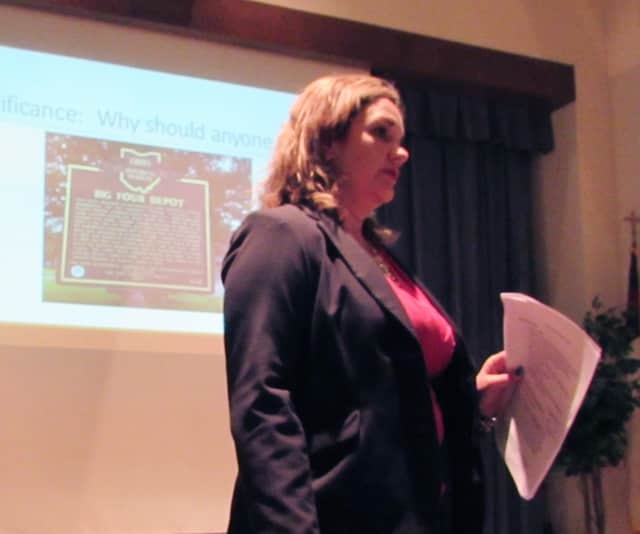 Wendy Zucal, executive director of the Dennison Railroad Depot Museum, has been working with the city to create a preservation plan. Transforming dreams into reality was the focus of a public meeting about Galion’s Big Four Depot on Monday night. “We’re at a tipping point to take our plans to the next step,” Wendy Zucal stated. She is executive director of the Dennison Railroad Depot Museum, a thriving tourist attraction in eastern Ohio. Earlier this year, the city contracted with her to help save Galion’s depot by: Facilitating the creation of a vision, helping to establish a non-profit board of trustees and initiating a strategy to move forward. Since then, ideas on what the depot should be used for have been tossed around: A business incubator, rental space for offices or community events, a brew pub, a coffee shop, a cultural center, a transportation hub, even an industry/railroad museum. The list goes on. Ohio had 400 railroad depots at one time. A website detailing what other remaining depots are being used for shows how many possibilities are out there. Click here to view it. Dreams like these are great, but Zucal emphasized that any future use of the depot must be financially sustainable. “Restoration is easy. Finding money for operations is the challenge,” she said. During the meeting, the audience into three groups to take those ideas and funnel them into a defined vision that would both serve an unmet need and generate income. Community members, railroad fanatics and government leaders brainstormed together. All of the groups agreed the depot will need to be a multi-purposed building — easy to do with the building’s three floors containing rooms of varying sizes. Whether it becomes a visitors center, a museum or another concept yet to be determined, the groups also agreed that several community partners will be needed to make the project a success. He noted that under city ownership, the depot has less options for grant and preservation funding. The next step is to establish a board of trustees, who will design a final vision and plan. In the meantime, the city has been working with a contractor to address immediate concerns like reinforcing the building’s foundation and replacing mortar on the east side. However, City Council appropriated just $50,000 for the repairs. It will take several years and much more capital to fully restore the building. Further ideas and suggestions can be emailed to Zucal at director@dennisondepot.org.